My Jesus | Dr. Justin Imel, Sr. The pain. The stares. The cane. The wheelchair. The falls. The exhaustion. The handfuls of medication. The disappointment from physicians. Living with a chronic neurological disorder is no fun. The divorce. The foreclosure. The miscarriage. The downsizing. The cancer. The addiction. The estranged child. Living in this fallen world is no fun. Life is no fun, but I thank God for my Savior. My Savior says this world is not the end. My Savior says He has overcome. My Savior says sin will not prevail. My Savior says all will be made right. My Savior says He will eradicate all disease. My Savior says I have a room reserved in His Father’s mansion. My Savior says my sins are forgiven. My Savior says I’m loved. If we’re to give thanks to God throughout November, we absolutely must pause and thank God for my Jesus. Paul thanked God for Jesus: “Thanks be to God through Jesus Christ our Lord!” (Rom 7:25) – “Thanks be to God for his inexpressible gift!” (2 Cor 9:15). He entered a virgin’s womb. Jesus’ birth has great significance for the child of God: The Holy God entered a world of sin, the Creator became the creature, the Son learned obedience, and the Lamb of God suffered for my sins. His sinless perfection left me an example. His sinless perfection allowed Him to be the spotless Lamb of God to die for me. His sinless perfection permits Him to be my high priest. Temptation torments me, and I know the tempter comes to you, also. The tempter came to Jesus, and Jesus overcame. Because He suffered temptation, he can be a sympathetic high priest for my infirmities. He Himself is the Truth. He taught the way of God. He taught me the true way to come to God and honor God. Imagine a world where Jesus lived without sin, obeyed the Father, and taught the truth, but no one recorded or taught others what Jesus had said. What good would such a Savior be? With the Twelve, Jesus sent forth the message of His salvation. His miracles, of course, stood as a testimony of His identity. But, His miracles of healing hold a special significance in my heart, for they foreshadow the day when all diseases are healed. He instituted the Lord’s Supper. I’m forgetful — my wife jokes that one day I’ll go to Wal-Mart, forget where I’m parked, and she’ll never see me again (disabled parking helps these days). Yet, when I come to the Table on the Lord’s Day, I remember what my Savior did for me. 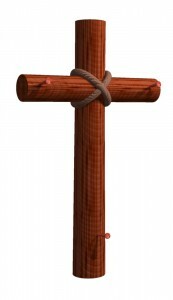 My sins reach to heaven, but One came from heaven to die on an old rugged cross that I might have salvation. My salvation is only possible through the death on the cross of Calvary. When the Lord walked from that tomb early on the first day of the week nearly two millennia ago, He conquered death. Death shall not have the final victory. Jesus has overcome. Jesus’ ascension is quite important. Without the ascension, Jesus could not have sent the Holy Spirit upon the Twelve. Without the ascension, Jesus could not sit at the right hand of God and be my merciful and faithful high priest. Without the ascension, Jesus could not be preparing me a home in heaven. One glorious day, Jesus will burst through the sky at the archangel’s trumpet blast, destroy this world with its sickness, bring vengeance on my enemies, and take me home to heaven. What a day what will be! I’m thankful I have an eternity to express my thankfulness to Jesus; a short blog post is not nearly enough space. God is that good! He will walk with me in the future as He has walked with me in the past! What have I omitted? What would you add? This entry was posted in 30 Days of Thanksgiving, devotion, Faith, God, Jesus, thankfulness. Bookmark the permalink.